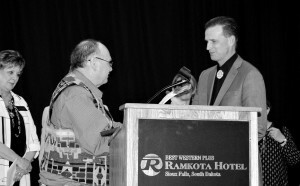 Each year, the South Dakota Advocacy Services presents a Legislative Advocacy Award. This award is in recognition of the role of the legislative process and an individual’s support for and participation in legislative activities that benefit the disability community within the larger community in South Dakota. Receiving the award for 2017 is Senator Troy Heinert of Mission, District 26. Heinert was presented the award at the annual SD Advocacy Service Partners in Policymaking banquet held in Sioux Falls on April 22, 2017.